Previous edition: published as by Siona Jenkins. 2008. Lonely Planet: The world's leading travel guide publisher With Lonely Planet's Egyptian Arabic Phrasebook, let no barriers - language or culture - get in your way. 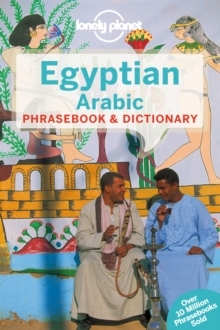 Grab this phrasebook and ride a camel around the Pyramids of Giza, visit the ancient monuments at Luxor, or take a relaxing cruise on the Nile. Chat with the locals and discover their culture& - a guaranteed way to enrich your travel experience. Order the right meal with our menu decoder Never get stuck for words with our 3500-word two-way dictionary We make language easy with shortcuts, key phrases & common Q&As Feel at ease, with essential tips on culture & manners Coverage includes: Basic language tools such as pronunciation; phrases for getting out and about, being social, food, safe travel, sustainable travel, and more; and two dictionaries Authors: Written and researched by Lonely Planet and Siona Jenkins.